April – the cruelest month – is the time when I start wondering when I can start introducing my overwintered plants back into the “wild”, aka bring them back into the great outdoors. Why is Dracula, coming to mind? I suppose annuals that I overwinter are my own way of interacting with the “undead”. I’m all for keeping stuff undead as much as possible. Within reason, of course! Anyway, overwintering means I end up with “Mother” plants, which get bigger all the time, and – because I take cuttings – plenty of fresh new ones to plant and give away. The other reason is to hang onto all those really special varieties of geraniums that are hard to find again. So, combination of $ saving and, conserving special varieties. This one in the picture is one I found at East of Eliza, when I was giving up all hope at finding a pale pink geranium last spring. Of course I had to save it. Grab some kind of tool, fork, trowel, two hands, or pointed stick, and mine underneath root ball, being careful to get all roots, and carefully lift. Throw a bit of potting soil, whatever is around, in bottom of new, smaller pot. Squash geranium into pot. If there is any soil around, throw on top. Look around wildly for any container I can stuff plant into. Recycling bin, yogurt container? Perfect! Old plastic bucket from dollar store? Even better! Yank plant out of pot it’s growing in. Stuff plant into new one. Bring indoors. Yank plant out of container by stems and leaves. Toss whole thing into plastic bag. Bring inside and hope I don’t forget what the hell is in it. Actually results are better with this method, if I remember to leave the leaves showing and tie the plastic bag around the root ball with its handles, but who has time to do this when you are recovering from running outside in the freezing cold in your pajamas? 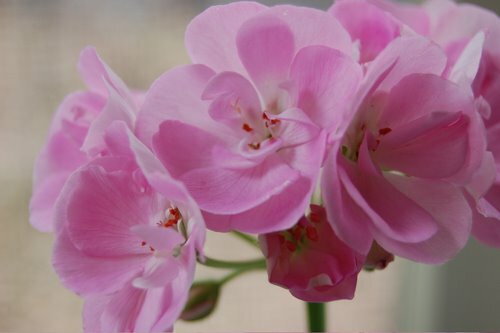 I am familiar with the midnight hustle to drag things, willy-nilly, indoors, but I’ve never had great success with overwintering geraniums. (OK, the one time I tried, I failed. I also failed with a gerbera daisy which developed such an entrenched case of aphids that I just gave up. I can, sometimes, make the rosemary last in about now when it begins to fret terribly.) 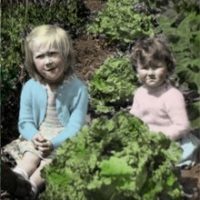 So, what are your techniques for keeping that geranium going, and happy?! Please share! If you can overwinter rosemary, you can overwinter geraniums! Rosemary is far pickier. Give it as much sunlight as you can give it, and not too much water (water only when soil surface is dry to the touch; underwatering is to be preferred to overwatering). Cool west-facing window is ideal. Give the plant a quarter turn every week or so to keep it from lopsidedness. You can cut it back in the fall to keep it compact — green stems only, not down to the woody stems — but this isn’t essential. Use the off-cuts to start new plants. As a general rule for all houseplants, never fertilize in winter, which encourages leggy growth. But you can start light feeding as the days begin to lengthen in the spring; end of Feb or March in Toronto. 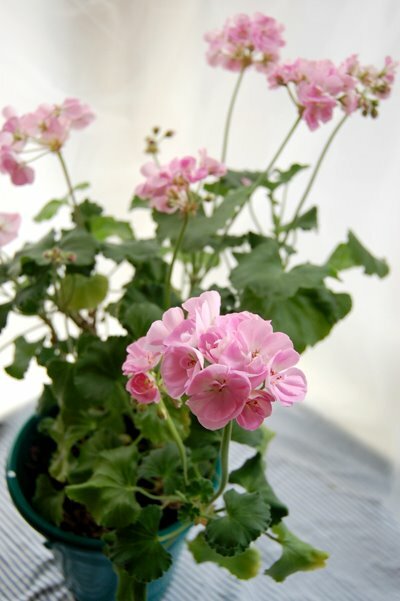 Start hardening off your geraniums outdoors as soon as it’s safe. They can take cool weather during the day, but watch out for nighttime frost. Sarah is the Overwintering Queen, and her big,unheated, south-facing enclosed porch has a lot to do with it. That, and she actually takes care of her plants. Anything to add, Sarah? The west facing, cool (ie, leaky) window I’ve got! 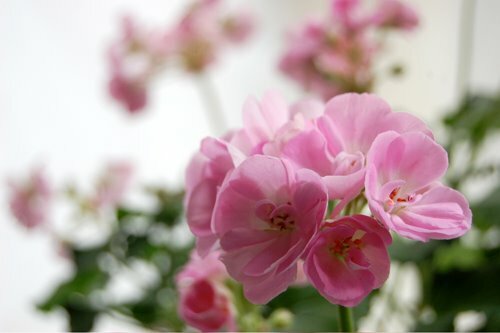 Next year I will try overwintering geraniums for sure. I love the idea of something – anything – blooming in March. Rosemary is always touch and go for me, but it’s doing ok so far, if a bit peaked at this point. If it can hang on for a couple more weeks until it can head outside it will be fine, but I find this is the trickiest part of the year for it. That’s true, it’s always darkest before the dawn! One crucial thing for overwintering, and it’s hard to do when the plants are so full, is to cut the plant back quite a bit when you bring it in, in fall. The light requirements are so reduced by the indoor light, most leaves are going to turn yellow anyway. 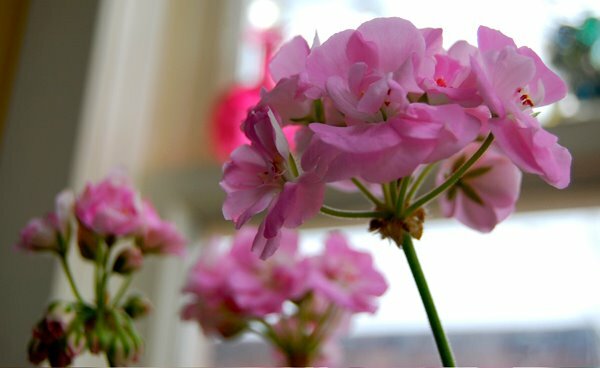 Put them in the brightest room you have, as close to the window as possible, keep reasonably well watered, (but geraniums can handle a bit of drought too.) So, water well, then let dry out a bit, then water well. Was just talking to a neighbour who does the “upside down in the basement method”, but that only works in old fashioned basements that were more like root cellars – with cool, moist air. I have no idea what the upside down part is supposed to be for! Some googling yesterday brought this info about the old fashioned hanging in the basement upside-down method of overwintering geraniums: “Hang plants upside down in basement with 80% humidity.” I think that makes today’s Canadian basements right out for this sort of treatment. If they dry out you are supposed to soak the roots in water to revive. Still no info on the upside-down aspect. I think we are safest simply keeping them in their pots, or repotting, put in a bright room, or in a window, cuttin back, and watering normally. Works for me. Thanks. I was afraid to put my Geraniums out so early, but nights are 6C now, and they’re up on a balcony – so no chance of frost and if there is, I’ll let them in for the night. Cuttings are a simple way to propagate, but starting from seed creates more vigorous younger plants. Unlike seeds, cuttings aren’t actually a fresh start. The cutting is the same individual as the plant it was cut from and so it simply continues to age. Rosemary… how many did I kill before I got the straight-dope on watering them? By nature they are desert plants with a very deep vertical root which they are denied in a pot. When potted, you must not water them until the tips start to bend over slightly, then submerge the pot in a bucket of water until all the air bubbles have left the soil, drain and place back in the sunniest location. Repeat.